I prefer not to dance with ghosts. They’re dreadfully insubstantial and all wrapped up in the haunted past. If only preference alone could rid of me them but no, the persistent little wisps keep placing their names on my dance card. On October 1st, 2017 shortly after 10:00 PM Stephen Paddock busted out the window of his 32nd floor Las Vegas Mandalay Bay hotel room and sprayed a large crowd of concertgoers attending the fourth annual Route 91 Harvest country music festival taking place across the street with rifle fire leaving 58 people dead and 489 injured. Four days later on October 5th, 2017 shortly after 10:00 AM I departed Salt Lake City, Utah to attend EVE Vegas 2017. I’ve a convoluted relationship with Las Vegas. In the waning days of August 2014 suffering heat stroke 55 miles north of Las Vegas I lost consciousness and pitched both myself and my beloved Honda ST1300 motorcycle off a freeway. I would survive, my motorcycle would not. A little over a year later as I drove by the location of the accident on the way to October, 2015’s Eve Vegas I was unsure if I’d remember exactly where the accident occurred but, though my mind wasn’t clear about the specific location, my body most definitely was and my chest constricted uncomfortably as I passed the Carp Elgin exit. Many of Paddock’s 2017 victims were taken to the University of Nevada Medical Center where I spent the night following that 2014 motorcycle accident. When I close my eyes I can picture my hospital room and I’m left wondering if any of Paddock’s victims convalesced in the exact same location. In 1998 an old flame of mine retired and moved to Mesquite, Nevada; the same town where the Las Vegas shooter resided. Before leaving for October 2017’s EVE Vegas I googled up the old flame’s address to discover flame and shooter live/lived at opposite ends of the small town. They probably didn’t know each other. Shortly after the Mesquite relationship fell apart I got myself entangled in an impetuous romance with a woman living in Las Vegas. Though the relationship didn’t last long, it still enthralled the hell out of me. Less than a year later at a May 1999 Las Vegas MGM Grand hosted Prince concert aftershow I caught sight of her (or a woman that looked an *awful* lot like her) out of the corner my eye. As the bulk of the 2017’s shooting casualties hadn’t been published before my 2017 EVE Vegas departure, I had to wait until mid-way through the space festivities to see if she was among the dead. She wasn’t. 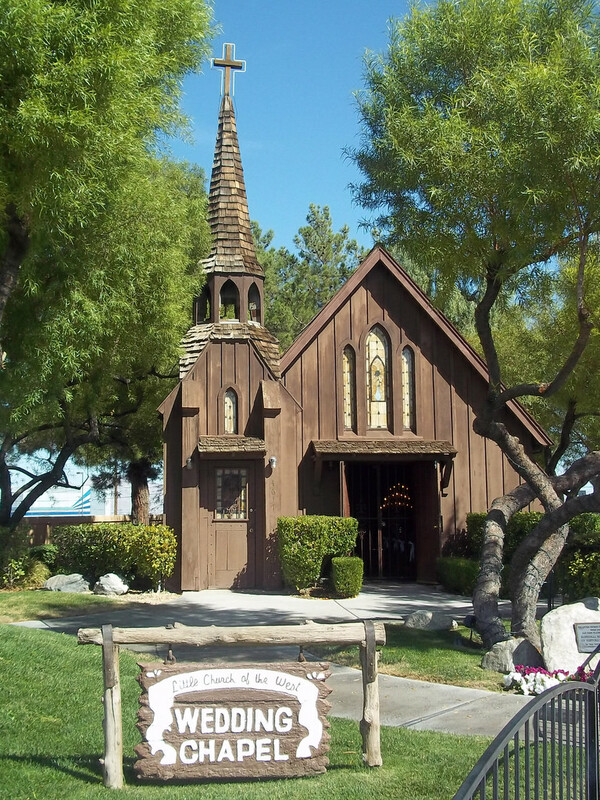 On December 31st, 1999, my niece was married in the Little Church of the West located but one and one half blocks south of the Vegas shooting and but 20 feet from one of the many impromptu memorials that have popped up. I stopped by Monday morning, October 9th 2017, to pay my respects to the chapel, my niece and the dead. As I walked the grounds recalling memories of the wedding I noticed several workers in the chapel sanding and repainting. Though not connected to the shooting, it still struck me significant. Grievous wounds, much like time induced decay, leave one little choice but to maintain, repair and move forward. Hosting a convention near the location of a United States record breaking mass shooting but five days after the murders presented CCP a host of problems. Given the difficulties I thought they navigated the situation admirably. 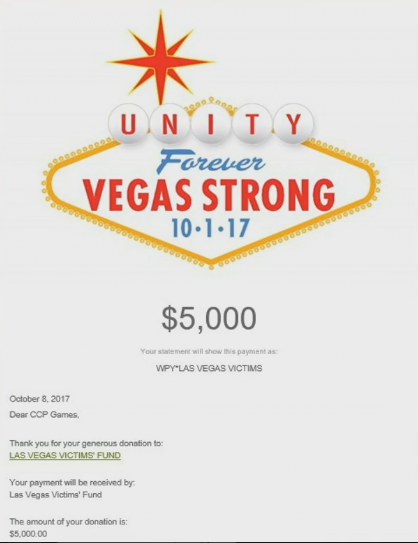 On October 2nd CCP Falcon crafted a by the numbers announcement clicking through the required ‘sympathies, condolences, thoughts and prayers’ American mass shooting response protocol requires – not bad for an Icelandic based company. In addition, at the opening ceremony Falcon called for a moment of silence, at the Saturday Night party Permaband avoided playing Killing is Just a Means [of communication] and at the closing ceremony CCP ponied up $5,000 towards the shooting’s victims. While none of these actions will significantly change things here in the United States (these days I fear nothing will), it was a nice set of gestures and I appreciated seeing them. As is becoming tradition, Nosy Gamer, Wilhelm Arcturus and I started off the festivities by making our way to Holstiens for alcohol infused milkshakes. As is also tradition, the milkshake I ordered proved over the top extravagant. 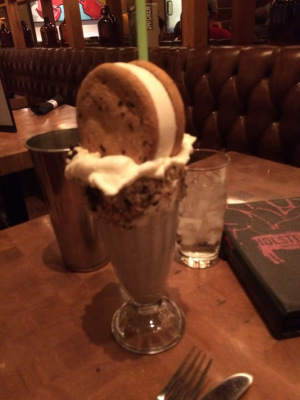 While 2016’s milkshake included an entire slice of pumpkin pie balanced precariously on the fountain glass, 2017’s Cookies and Cream shake managed to compete by topping off the drink with a massive chocolate chip cookie ice cream sandwich. Wilhelm snapped a picture. Combining the healthy dose of Pinnacle Whipped Cream Vodka in the shake with the few Rum & Cokes I’d consumed at the blackjack tables a little earlier, I found myself in the midst of an early evening alcohol laced sugar high – a curiously pleasant mixture I’m happy to recommend. While waiting in line to enter the venue I once again found myself standing to next to skinny wormhole girl. She gave me a package of Deseret Gardens Southwest Pasta Soup mix. This too is growing into a tradition. Being a morning person, once I figured out the layout of this year’s venue (The Linq can be terribly confusing), I took to eating breakfast out on the Linq Promenade where other morning gamers (or at least East Coast time zoners) like Signal Cartel’s Mynxee and Johnny Splunk puttered about. For an unimportant space nobody, I’m getting to know a variety of EVE players. For many players, gatherings like EVE Vegas are primarily social events and while I spent a fair amount of time socializing, given the circumstances, I mostly wanted to escape into the game. Accordingly, I attended no less than 8 developer presentations, 5 player presentations and 3 roundtable discussions. It was a good year to nerd out as this EVE Vegas proved unusually substantive. CCP cleverly placed each and every player presentation in the Main Showroom thereby highlighting the centrality of players to EVE by physically centering them at the convention. The five player presentations I attended varied between damn fine and extraordinary. While everybody no doubt has their favorite, I was most impressed with Elise Randolph and Debes Sparre’s How to Build Doctrines for the simple reason that they set the entire presentation up like fitting out a ship – as you build your ship, so you assemble your fleet. A simple and illuminating analogy. 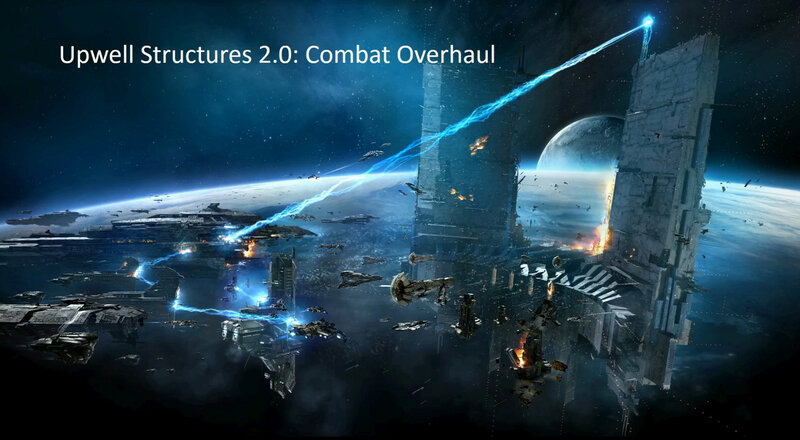 Meanwhile CCP Rise and CCP Fozzie earned a lot of love announcing imminent Heavy Assault Cruiser & Assault Frigate rebalancing as well as revealing upcoming changes to Upwell Structure reinforcement mechanics. In both cases their approaches struck me clever (unique, highly effective short burst damage controls for the ships and the opportunity to up and shoot at Upwell structures burning through that first shield reinforcement whenever an attacker feels like it). Even more importantly, CCP is toying with the idea of doing a Monthly Balance Report much like the current Monthly Economic Report. I hope they follow through on this as it will add observable structure to balance work creating both an ongoing point of study and discussion. 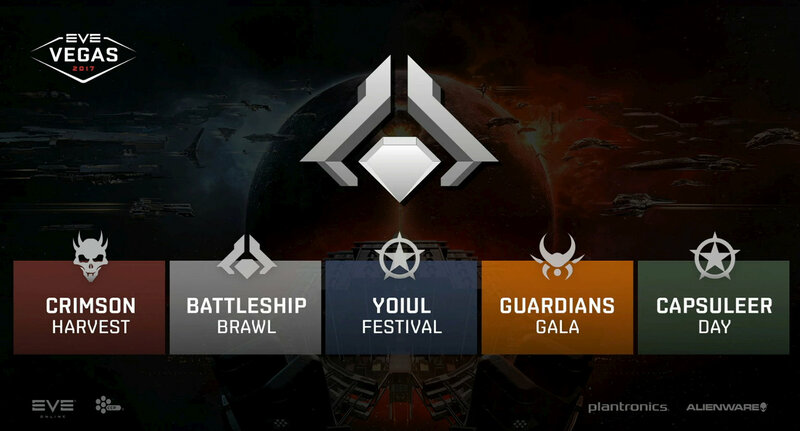 Alpha clones will be getting a healthy boost being able to both cross train all the races and limp into battleships. Again, CCP’s approach struck me clever as “Alpha Primes” will make CCP money on their way to “Super Alpha” status. Finally, CCP Affinity absolutely made my day at the Resource Wars Roundtable when she casually deployed the term ‘social onboarding’. CCP Affinity heads up Team Genesis (the group charged with the New Player Experience) and Resource Wars is work designed to follow-up on the NPE. If you ask me, the most difficult thing with any EVE NPE isn’t teaching EVE’s mechanics (as troublesome as that can be) but, instead, enticing new players into appreciating that long term EVE means sandbox play where other players will be central to your experience. It’s difficult to create a computer program that handles that transition gracefully – that ‘social onboards’ players who, to date, have interacted only with a computer. While I can’t say that Resource Wars will pull this off (even Affinity was cautious about making such claim), I can say that CCP is pecking at the correct problem. 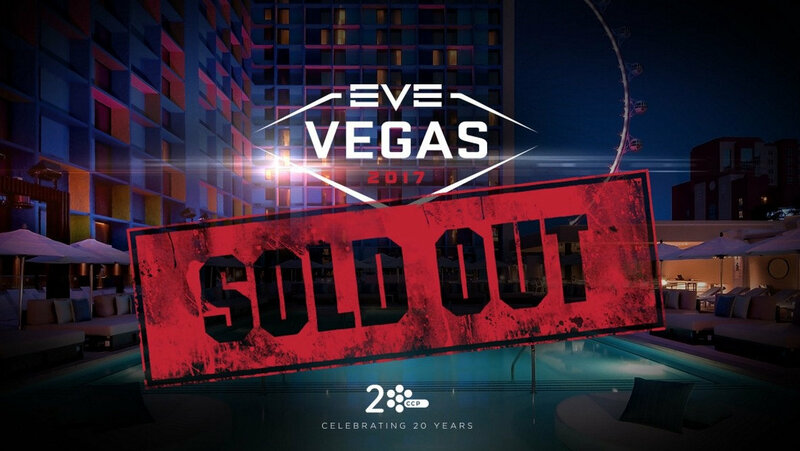 Though feeling a bit somber from the get-go, I’m pleased I attended EVE Vegas 2017. I danced with a few ghosts both old and new as trips to Vegas always demand of me as well as wove in another batch of pleasant memories connected to the same location. Such is the rich bittersweet tapestry that is life and death in my United States. Did you enjoy the read? Please consider supporting Crossing Zebras. A soloish long-term casual player since 2009, sporting a troubling history of preying on the good people of highsec, these days DireNecessity enjoys the gentle pleasures like manufacturing, grandbabies and formal dining.